Bronn and Jaime on the battlements of some castle/walled city looking at the ranks of Unsullied and then Dothraki cavalry. Dany decided not to send the Unsullied and Dothraki to King's Landing. Cersei: How many dragons did you see at the pit? Cersei: What happened to the third? Jaime: For all we know, it's guarding her fleet! Cersei: She came here with her dragons and her Dothraki and her Unsullied. She came here to show us all her power. You can see the Red Keep on far-left Corner, atop Aegon's High Hill. The Unsullied are holding positions outside the city. So it's evident that it's King's Landing. CERSEI: Why isn't she with them? QYBURN: I'm afraid I don't know, Your Grace. No one has seen her. CERSEI: And the rest of them? QYBURN: They're on their way to the Dragonpit now. Dragonpit is in King's Landing, on Rhaenys' Hill. Later when Tyrion goes to meet Cersei alone, he meets her in their Father's old office, in Tower of the Hand, inside Redkeep. The troops that she did send (from the Tyrells and Martells) were sunk and/or captured. Instead of sending the Unsullied to King's Landing, she had sent them to Casterly Rock. And the Lannister army went to Highgarden (Tyrells). The Lannisters went back to King's Landing and she sent the Dothraki there with her dragons. 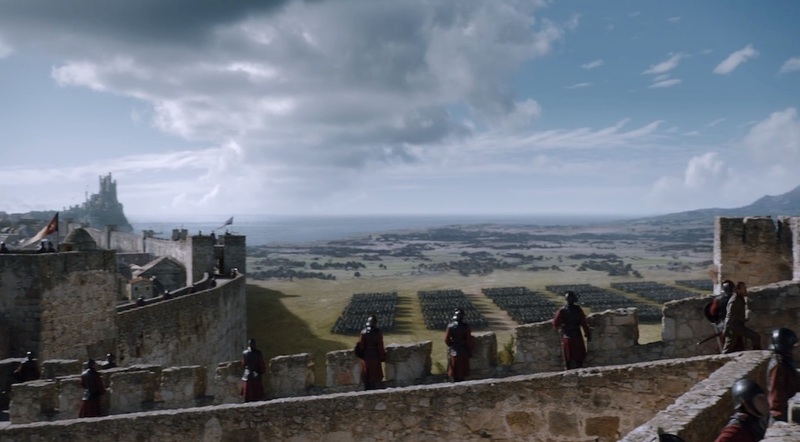 The Unsullied reached King's Landing later, although they started about the same distance as the Lannister army. You should also realize that what you're seeing is months later. Conditions changed, so her decision changed. It seems like less of a time, because comparatively little was shown happening in between. But there's been something like a month or so between most episodes this year. One episode, Jon Snow is practically dead. The next he's up and moving without issue. One episode, the Unsullied are on the east side of the land with Daenerys. Then they're on the other side, with ships. Then they're back on the same side at King's Landing. Those things take months. It's not like our world where you can hop on a plane and be on the other side of the planet tomorrow. But in story terms, they go directly from one place to another and skip the travel between. Why do they portray characters with beard/eyebrows not matching their hair?